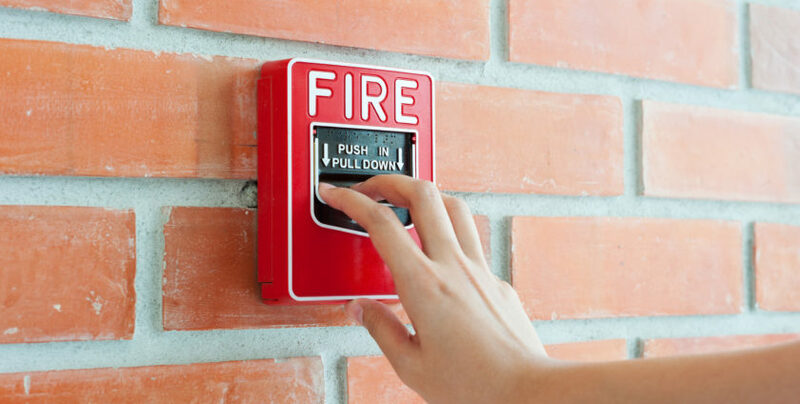 While fire protection in a building is necessary to adhere to regulations, it is ultimately about ensuring the safety of building occupants and about preventing loss of life. This is the main point that international fire protection expert, Marco Antonelli, emphasised when he addressed members of the Southern African Institute of Steel Construction (SAISC) in South Africa. Antonelli has more than three decades of experience in the fire protection industry and is currently Promat’s head of product management. 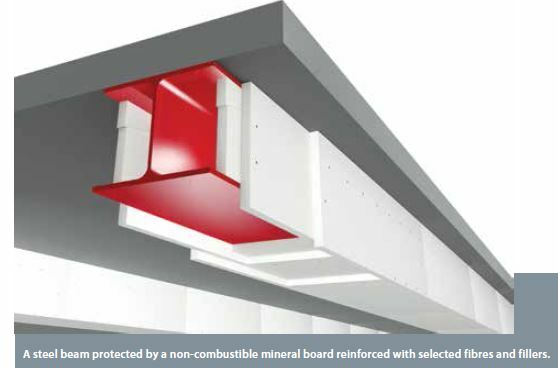 As part of the Etex Group ‘Marley Building Systems (PTY) LTD’ imports and supplies the complete Promat range of passive fire protection solutions including fire tested walls, ceilings and floors and penetration seals for all of these. Marley Building Systems was proud to host Marco Antonelli in South Africa for a full week facilitating structural steel protection seminars around the country. To protect against fire, one has to understand fire. The famous Christmas tree experiment, where a plastic tree is set alight in a small room, shows how a very small flame can spread rapidly in just one and a half minutes. In a mere 20 seconds, enough energy is released for the flames to engulf the entire tree and for the fire to start spreading to other close objects. The white smoke seen around the burning objects is water as the humidity goes out of all the combustible material. Once the gases that are extracted by the heat start to burn all together, it is called a flashover and from this moment on (at about one minute), the fire is out of control. Antonelli notes that 30 years ago, the time before a flashover was between five and ten minutes. Today, the average is more or less three minutes, because there are more combustible materials inside smaller buildings. This means that if the fire is not extinguished within two or three minutes, it gets out of control and the building can only be saved through specified passive fire protection. 1. Passive fire protection is not an alternative or opposite of active fire protection. They work together. Active fire protection, such as a sprinkler system, can control a small fire in the first phase, but if the fire gets too big or continues to spread, passive fire protection provides a second barrier, a plan B. 2. Some mistakenly think that active fire protection is to protect life and passive fire protection is to protect buildings. It is not. Passive fire protection gives people inside the building time to exit safely, allows the fire brigade time to enter the building and check that everyone is out, and also protects the property because it limits damage. In order to give occupants a way to escape the building in an emergency, the escape route needs to be protected, normally through compartmentation using fire walls, partitioning, ceilings and structural protection. The latter is crucial, because if the building collapses, it doesn’t matter how good the compartmentation was – people can die and the building will be lost, with possible additional damage to surrounding buildings. To protect a building against fire, it should be designed to keep the fire load (the quantity of potential energy in a building than be released during a fire) as low as possible. One therefore has to determine the fire-resistant time of the loadbearing elements, to be sure that they will remain in place for all the duration of fire, which mainly depends on the fire load (and some other parameters). • Limiting the fire load in the building. The less energy potential in the building, the cooler and less severe the fire. • Oversizing the structural elements so that the resistance is bigger, but this is can be expensive. • Using protective material around the steel to keep the temperature down. “You have to find a way to protect what is necessary. In terms of cost, you don’t want to protect what is not necessary. Find the part of the building that is weak or where you may have a potential collapse, and invest time and money there,” Antonelli advises. In most countries, a prescriptive approach is followed for fire protection. Using this approach, to check if the loadbearing elements are performing, every single element needs to be checked one by one. On the other hand, a performance approach is not grounded on regulation, but rather on calculations based on a specific scenario. 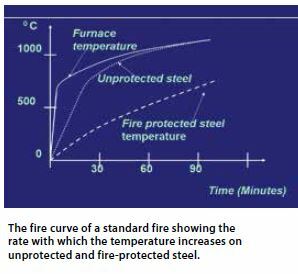 In such a case, the specifier needs to create a hypothesis of the fire, take into consideration the whole building and understand the behaviour of the steel elements during fire. In general, a complex combination of the steel element performs better than a single element, resulting in less protection required. But, warns Antonelli, every connection can also be a weak point, because the moment the connection fails, the whole structure becomes weak. 1. There was almost no compartmentation in the building. The building standards of the City of New York at that time stipulate that if a sprinkler system is installed, compartmentation is not necessary. That is why the fire quickly engulfed seven floors of the building. 2. There were some weak points in the structure. The tower was built with perimeter columns – a cylinder within a cylinder – with concrete floors between the external and internal columns. The weak point for fire was the connection between the floor and the cylinder because of the deformation of the steel truss. At a certain moment, the force was too big and the floor detached from the column, resulting in the collapse. With regards to fire protection for steel, one of the most important considerations is the mass factor – the surface exposed to the fire, divided by the volume of every single steel element. The smaller the surface and the bigger is the volume, the longer the steel takes to heat up. One therefore has to calculate the heat stored in the protection layer, relative to the heat stored in the steel. If the steel structure is expected to reach a critical temperature too quickly, more protective material is required. Another possible unknown factor can be the thickness of the protective material, because if it is an intumescent paint, the thickness constantly changes during a fire and is therefore not accurately predictable. According to the Eurocode, the only way to accurately calculate the lambda value during nominal fire exposure is through testing according to EN13381-4/8. Fire tests are a critical component in the process of designing a fire-safe environment because the only way to understand the behaviour of the material is to test it for its intended use. The more precise the standard, the better one can evaluate the real condition and determine the material needed. “What I have seen, is that the European (EN) standard is becoming more and more popular outside of Europe because the results are safer and closer to reality. It is more complicated and, sometimes, more expensive, but safety comes first,” Antonelli states. 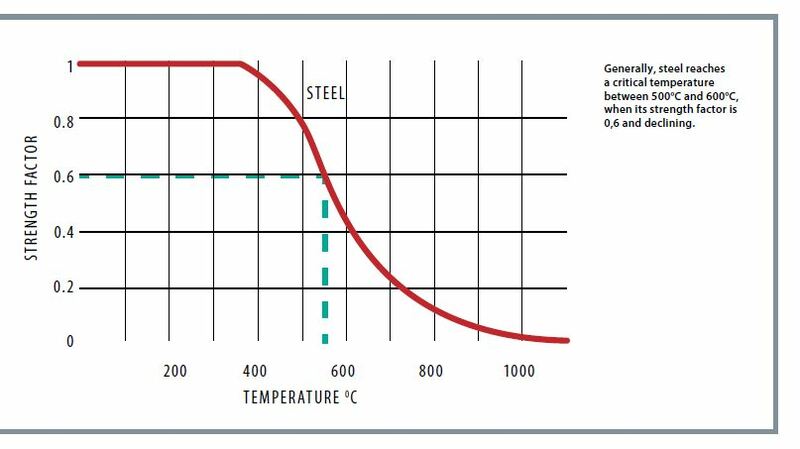 Another important factor in determining the necessary protection is the critical temperature of steel, defined as the temperature at which the material loses much of its strength and can no longer support the design load or actions. It is based on the ratio between the loadbearing capacity of the element and the action (kind of load) during fire. The result of the calculation is a number between zero and one. Antonelli stresses the importance of precise calculations, not just to ensure adequate protection, but to enable savings. “During design, if calculations are done correctly, there is always a perfect balance between the minimum acceptable level of protection and the maximum level of steel reduction, resulting in possible cost savings,” he says. 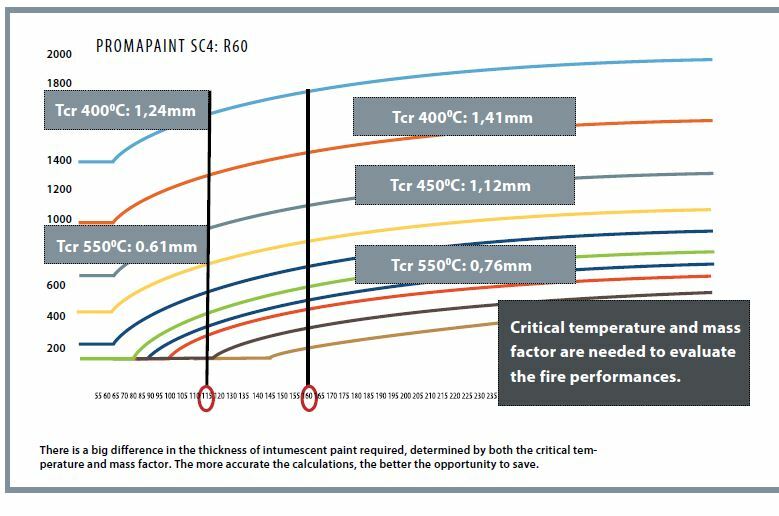 For example, if you have a steel element with a mass factor of 160 and the critical temperature is 400°C, one might need 1,4mm of a certain intumescent paint. However, if the critical temperature is 450°C, the required thickness is 1,1mm – 30% less – and if the critical temperature is 550, one only needs 0,7mm – 50% less. Also by using a bigger steel element, decreasing the mass factor from 160 to 115, between 15% and 20% less material is required. Developed in 1963 to protect the Apollo capsule, intumescent paint is easily applied to any steel structure and with ranging thicknesses, and offers varying protection times. When the temperature rises, a chemical reaction between the active components causes expansion which creates an insulating foam-like coating, which protects the steel by slowing the rise to its critical temperature. It can also be used on concrete and timber. Composed of cement or gypsum, and often containing other materials such as mineral wool, perlite or vermiculite, sprayed fire-resistive material (SFRM) increases the fire resistance of structural elements, primarily through insulation (λ value), heat capacity (high density) and endothermic reactions (including water evaporation). It has constant thickness and it doesn’t need any surface preparation. Because of the mass factor of the boxed shape of board protection, it performs better than the same element that it protected with paint because the surface exposed to fire is much lower. However, it weighs much more, is expensive and is not suitable for protecting complex geometry. “The reality is that there are no simple solutions. One has to accept that it is complex and it is up to us to find the best solution,” Antonelli concludes. Full thanks and acknowledgement are given to Marco Antonelli, Promat and Marley Building Systems for the information given to write this article.